1. In a frying pan, heat olive oil on medium heat. In a pot, bring water to a boil for the pasta. 2. Chop the onion into medium-sized pieces and add to the frying pan once oil is hot. Allow to cook for about 5 minutes, stirring often. 3. Wash and chop your greens into bite-sized pieces. Drain and rinse the chickpeas. When onion has cooked for a few minutes, add the remaining vegetables and the oregano and stir to coat them with oil. Reduce the heat and cover. Stir the mixture every few minutes. 4. Once the water has come to a boil, cook the pasta according to package instructions. Do not start cooking the pasta until the vegetables have been cooking for a few minutes. 5. Drain the pasta and serve topped with greens and chickpeas. Crumble feta over the dishes and serve immediately with a drizzle of olive oil and salt and pepper to taste. There is nothing but goodness on this plate. 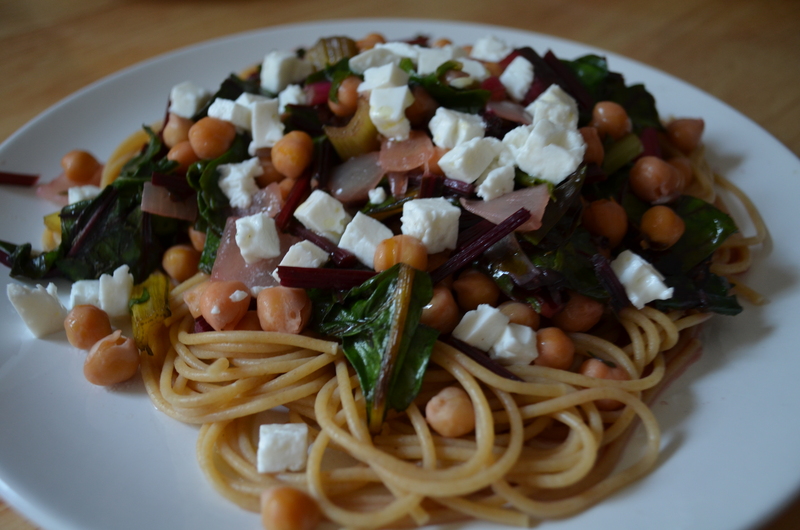 This entry was posted in Entrées, Grains, Greens, Legumes, Quick Meals, Vegetables, Vegetarian and tagged chickpeas, feta, greens, leafy greens, pasta, quick, spaghetti by laratboulos. Bookmark the permalink.